Marci Ebeling and John Shuman settled in Trout Lake, Washington, in 2005 after hiking the Pacific Crest Trail. 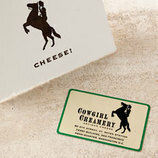 They soon set about reviving the community's dormant cheesemaking tradition, and Cascadia Creamery was born. 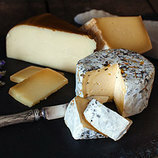 Cascadia uses certified organic cow's milk from a fourth-generation dairy that breeds Jersey, Dutch Belted and Friesian cows to make an array of cheeses that are aged in a special aging room built inside a lava tube cave. 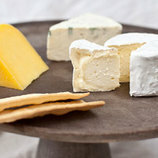 The natural cave air has an ideal temperature and humidity content for ripening cheese. 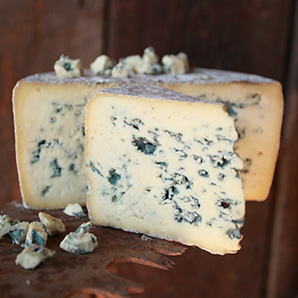 Cascadia Creamery describes this raw cow's milk cheese as their "Gateway Blue," a cheese that is sure to win over those who thought they didn't like blues. Made with raw cow’s milk, its texture is dense, and its flavors range from tangy buttermilk to roasted nuts, cocoa nibs and beef.